WASHINGTON, D.C. -- President Vladimir Putin's popularity in Russia is now at its highest level in years, likely propelled by a groundswell of national pride with the annexation of Crimea in March on the heels of the Sochi Olympic Games in February. The 83% of Russians saying they approve of Putin's leadership in late April/early June ties his previous high rating in 2008 when he left office the first time. 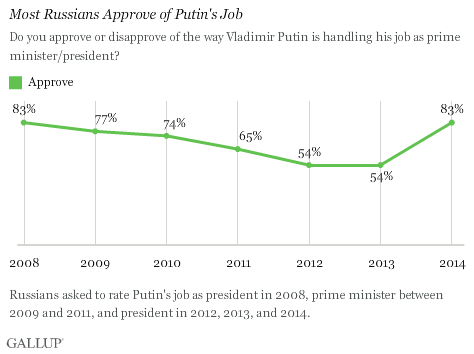 The 29-percentage-point increase in Putin's job approval between 2013 and 2014 suggests he has solidified his previously shaky support base. For the first time since 2008, a majority of Russians (73%) believe their country's leadership is leading them in the right direction. 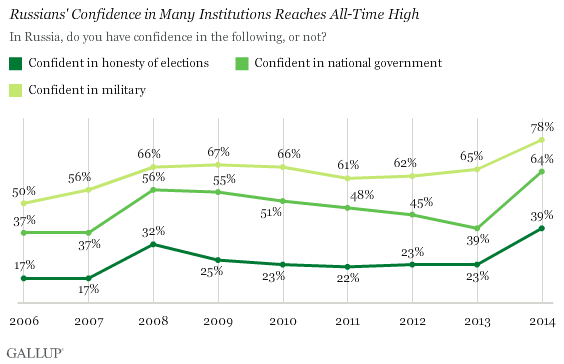 This renewed faith is apparent in their record-level confidence in the country's military (78%), their national government (64%), and honesty of elections (39%). Russians' positivity also colors other aspects of their lives. While Americans have become less satisfied with their freedom to choose what they do with their lives, Russians became more satisfied in 2014. A record-high 65% of Russians are satisfied with their freedom. Some of this may be attributable to improving economic perceptions. Despite U.S. and European sanctions earlier this year over Moscow's intervention in Ukraine, more Russians see their economy getting better now than has been the case since 2008. However, the economic outlook still remains relatively weak, with 35% of Russians saying conditions are getting better and 19% saying they are getting worse, and the jobs outlook has not improved. At the same time that their faith in their own leadership has been renewed, Russians' approval of the leadership of the U.S. and the EU are at all-time lows. The single-digit approval of the leadership of the U.S. and EU at least partly reflects Russians' displeasure with the position each has taken on their country's ongoing involvement in Ukraine and its annexation of Crimea. The U.S. broadened sanctions against Russia on Wednesday to target banks and energy companies, and EU leaders also say they intend to increase sanctions. As Russia's relations have frayed with the West, it has sought to improve relations with China, inking a $400 billion gas deal in May and lauding the country as its most important economic partner. Russians' approval of China has soared in kind, reaching a record 42%. Recent events raised Russian residents' confidence in their government and various national institutions to their highest points in the past decade. Even with increasing diplomatic isolation and a possible weakening economy with tougher sanctions, the vast majority of Russians will likely give their government full support in whatever course of action it chooses. Russians' rising approval of their own leadership and China's, along with their record-low approval of the leadership of the U.S. and the EU, underscore the massive divide that exists between Russia and the West. It could take years to restore the relationship between Russia and the West, and will require substantial effort on both sides. Results are based on face-to-face interviews with 2,000 adults, aged 15 and older, conducted April 22-June 9, 2014, in Russia. For results based on the total sample of national adults, the margin of sampling error is ±2.7 percentage points at the 95% confidence level. The margin of error reflects the influence of data weighting. In addition to sampling error, question wording and practical difficulties in conducting surveys can introduce error or bias into the findings of public opinion polls. 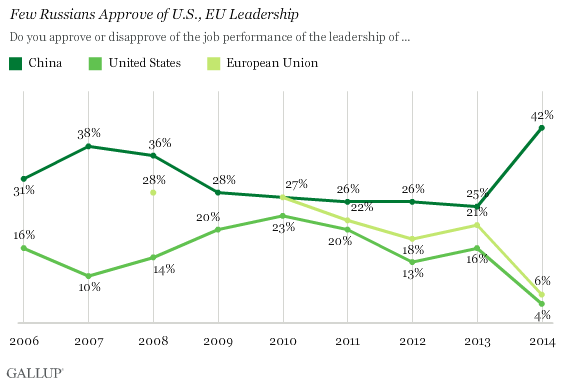 The leadership of the U.S. received higher approval ratings worldwide in 2013 than the leadership of Germany, the European Union, China, and Russia. After hitting a low point at the end of President Barack Obama's first term, U.S. leadership ratings worldwide rallied in 2013 as he began his second. In the midst of the conflict in Ukraine, half of Americans say the U.S. and Russia are heading back toward a Cold War. Older Americans and Republicans are more likely to feel this way than other groups.